Were modern humans so superior that they drove Neanderthals to extinction, or did their lonely existence leave them genetically vulnerable? Were humans responsible for the extinction of New Zealand’s moa, or were they already in decline? Walking around in the Australian bush we can see a dazzling array of different flower colours, but have you ever wondered how and why these evolved? 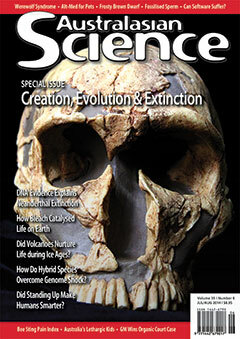 Feature: Did Standing Up Drive Human Evolution? Watching a toddler learn to walk has led to a new hypothesis that bipedalism drove the evolution of the human brain. Researchers studying the diversity of life in Antarctica have found surprising evidence that many plants and animals survived past ice ages by huddling close to warm volcanoes. A chemical found in hair bleach may have catalysed life, and can even explain why new life is no longer being created from non-living building blocks on modern Earth. A sequence of the world’s oldest rocks in the depths of the Mariana Trench indicates that both plate tectonics and life may have commenced on Earth 4.4 billion years ago. Your map of the night sky for June 2014. People are more likely to support climate change mitigation when they are first confronted with the local adaptations that will be required. Strategic investment in technology, science and engineering innovation is required. Conventional approaches to conservation can learn from complex military decisions in Afghanistan. The Western Australian Supreme Court has dismissed an organic farmer’s claims for damages from his neighbour’s genetically-modified canola crop, which caused him to lose organic certification for more than half of his property for almost 3 years. Synchrotron imaging of a 16 million-year-old ostracod found in NSW has revealed the world’s oldest fossilised sperm. While road funding regulations remain messy, the Abbott government has supported a second Sydney airport over a high speed rail line linking the east coast cities. Long before he struck upon his theory of natural selection, Charles Darwin experienced a revelation while exploring the Blue Mountains. A new review offers a modern perspective on clinical lycanthropy and other delusions of animal metamorphoses. The coldest brown dwarf ever known has been discovered only 7.2 light-years away. Quandary: What If Computers Have Feelings, Too? If software becomes intelligent, what are the ethics of creating, modifying and deleting it from our hard drives? Science could be promoted to the front row of the political agenda by advising the under-resourced Senators who hold the balance of power. Materials scientist Prof David Sholl explains how new hi-tech metal hydrides and metal-organic frameworks can be used to increase the efficiency of nuclear power stations and to capture carbon dioxide emissions in coal-fired power plants. Take a look at several domesticated mammal species and you might spot a number of similarities between them, including those cute floppy ears. A CSIRO study offers the first indication of fugitive emissions from coal seam gas wells under Australian conditions. The future looks very bright for Australian radio astronomy but it was somewhat clouded earlier this year when CSIRO’s radio astronomy program took a dramatic hit in the Australian federal budget. A transcript of the 2014 Jack Beale Lecture on the Global Environment hosted at the University of New South Wales. On science and technology, the Abbott government is somewhat of a paradox.